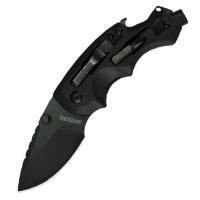 The Kershaw 8720 Shuffle DIY is a versatile utility knife designed for hard work. It features a short, broad drop point blade that holds a cutting edge easily. Its black oxide coating resists scratching and wear, and jimping on the reverse edge provides additional control for precise work. The blade deploys manually, and its liner locks ensure that it stays deployed until you disengage them. The glass-filled nylon handle comes with sculpted finger contours and a textured surface to provide a secure grip. It includes a built-in bit driver, with recessed storage areas for the included flathead and Phillips bits. It also features a bottle opener, perfect for when your work is finished. Its deep-carry pocket clip makes it easy to carry with you, so you can always have it when you need it.